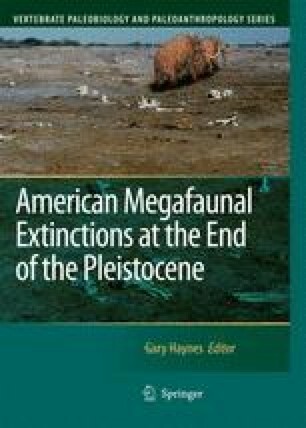 If we ever hope to ascertain the cause(s) of the extinction of North American megafauna at the end of the Pleistocene, a necessary first step is to establish the chronology of this occurrence. Was it an abrupt event, in which about 30 or more genera disappeared simultaneously within no more than several hundred years, or instead a long, drawn-out, gradual process, with each species dying out independently and asynchronously, over the course of millennia? Those who advocate a vague climatic/environmental cause favor the latter gradual scenario; they recognize that if the extinctions were shown instead to be abrupt and synchronous, it would compel them to “attribute to the extinction ‘event’ …speed and taxonomic breadth …Once that is done, explanations of the extinctions must be structured to account for these assumed properties, whether those explanations focus on people, cli-mate…or disease” (Grayson and Meltzer, 2002:347). CARD (Canadian Archaeological Radiocarbon Database, compiled by R. Morlan). (2001) Online website http://www.canadianar-chaeology.ca/accessed6/04.